Medical care in the United States has been loudly derided as inferior to health care systems in the rest of the developed world in highly publicized rankings, most notably the World Health Organization’s World Health Report, which looked at care in almost two hundred nations. These rankings have gained tremendous traction despite being exposed in leading academic journals for gross distortions from methodological ﬂaws, including huge measurement errors that produce results with no statistical signiﬁcance, data missing from dozens of countries, biased assumptions, and extreme subjectivity. Government ofﬁcials, policy makers, insurers, and even many academics have used this pseudo-data to justify their personal agenda: centralizing government power over health care by imposing the radical changes in the Patient Protection and Affordable Care Act (also dubbed ObamaCare) on a largely unwilling public. Much of the American public assumes the criticisms of our system are sound—the calls for change have been so ubiquitous and the topic so complex. Indeed, a large majority have repeatedly concurred that their health care system needs “fundamental change” or “complete rebuilding.” But despite that general opinion, multiple studies show that more than 80 percent of Americans are satisﬁed with the quality of their own health care, a number that has risen steadily over the past several years. This striking contradiction, ignored by policy makers calling for radical changes in the state of America’s health care, reveals a fundamental truth: Americans understand from personal experience that their medical care is the best in the world. They understand what they could lose in a government-centralized health system in which government is empowered to exercise unprecedented control over the most personal decisions in their lives. The facts confirm that American health care is superior. The world’s leading journals are full of studies demonstrating the superiority of American medical care to that found in countries with systems more heavily controlled by government bodies. These studies verify better survival from serious diseases like cancer; better access to treatment for the most prevalent chronic diseases; wider access to preventive care and cancer screening; broader availability of the newest life-changing medical technology; wider access to the most accurate diagnostic technology; quicker access to innovative, life-saving cures and safer, less invasive treatments; more rapid access to highly trained specialists; and ultimately far better access to the world’s leading doctors and medical scientists, who themselves are the source of the world’s leading innovations. But regardless of the amazing quality of American medical care that has evolved over the past half century, there is broad consensus on a number of signiﬁcant problems. Costs are high and increasing. It is unlikely that government and society can continue to spend such huge sums of money and an increasingly large proportion of GDP on health care. The lack of portability of health insurance in the American system, which largely relies on employers for insurance, needs to be addressed. So does the fact that millions of Americans are uninsured. Congress and the Obama administration have claimed that a major principle underlying their recently passed health care reform is more competition among health insurance providers. Increasing competition would seem to be a fundamental means of reducing cost, but unfortunately the law will not do so. The health legislation creates massive new government authority that controls access to medical care and dictates insurance beneﬁts. Rather than increasing private-sector competition, ObamaCare will reduce choice, shift more regulatory power to bureaucrats, and hinder private sector innovation. Ultimately, the law is likely to serve as a rationale for shifting Americans to public plans that further restrict access to care. The overall goal of any health reform plan should be to increase the opportunity for good health for Americans and their families. Key principles include reducing the number of uninsured, facilitating access to affordable health insurance that people want rather than are forced to purchase, making health insurance more portable, and promoting innovation in health care, so that the excellence of our care is not sacriﬁced and individuals and their families are empowered to decide how best to spend their money in health care decisions. Here are six straightforward steps that the government could take, right now, to increase competition in the health insurance markets and empower consumers so that costs come down by value-based purchasing rather than government edict. These reforms would reduce the number of uninsured, facilitate access to affordable insurance, make health insurance portable, and promote innovation. Americans understand from personal experience that their medical care is the best in the world. A ﬁrst step to increasing competition in the health insurance market is to allow cross-state purchasing, so people can shop in a national market for the insurance they actually want to buy. It is ill conceived, unnecessary, and self-defeating to force Americans to restrict their purchases to in-state goods or services. Government can rapidly lower the price of health insurance through the private insurance market by breaking down these anticompetitive barriers, which result in shocking price variations among states for equivalent coverage. Small businesses should be allowed to band together in trade associations to purchase coverage for their employees. If regulated by the Employee Retirement Income Security Act of 1974 (ERISA), they would be exempt from state health insurance mandates and regulations. Since small-business employees make up the biggest proportion of uninsured workers, this change would make a big impact. Second, government can force transparency on the system, ensuring that Americans have a clear understanding of the price and quality of their doctors and hospitals as well as enough information about health and diseases to make informed, value-conscious decisions. Under our current system, few patients are aware of the charges about to be incurred for their medical care. Generally, they have no reason to ask—the current third-party-payer structure makes patients believe that someone else is paying. This lack of demand for price information has allowed hospitals and doctors to cloak their price structure in a shroud of mystery. Let’s allow the experts—medical scientists in their peer-reviewed literature—to determine efﬁcacy and clinical utility; government can ensure transparency of the prices and visibility of qualifications. When patients know how much procedures cost, physicians and hospitals will be spurred to provide competitive pricing. ObamaCare will reduce choice, shift more regulatory power to bureaucrats, and hinder private sector innovation. Third, it is time to reduce the mandate-created distortions of health insurance markets. State-based mandates alone now number above 2,100 and are a scandalous abuse of government dictates. They increase insurance costs by 20–50 percent and force Americans to buy policies covering massage therapy, acupuncture, chiropractors, in vitro fertilization, wigs, and other services not necessarily wanted by more than a small minority of American families. Instead of adding mandates that Americans rationally do not consider a good value, the government should focus on creating an environment in which insurance products can become attractive to consumers. Fourth, it makes sense to expand consumer choice by increasing instead of restricting the availability of insurance, and simplifying rather than complicating the rules and regulations governing lower-cost health plans, such as high-deductible plans for catastrophic coverage with health savings accounts (HSAs). This will make insurance an attractive purchase—a good value—for the millions of Americans, particularly younger and healthier people, who can afford insurance but currently (and perhaps wisely) choose to forgo a purchase they consider a poor value. Health savings accounts increase choice for consumers, expand individual ownership and control over health spending, promote price visibility to allow value-based purchasing, and provide incentives for savings to prepare for future care needs. Congress should permit more ﬂexibility in employer contributions to “disease management accounts” in lieu of traditional third-party beneﬁts, support tax reform proposals to allow parents’ HSA balances to transfer to their children’s accounts tax-free, and allow holders of HSA plans who relocate because of a job change to purchase health insurance across state lines without being subject to state mandates. When patients know how much procedures cost, physicians and hospitals will be spurred to provide competitive pricing. Fifth, government can empower the consumer by revamping the tax treatment of health care expenses. A number of such creative reforms have been ignored. For instance, a national system of refundable health care tax credits—actual cash even for those who pay no income tax—would foster personal ownership and control of health plans and increase the market competition that the administration claims it seeks to advance. The essential portability of insurance—truly owned and designed by American consumers—would eliminate the fear that job loss would lead to loss of coverage and financial disaster, and create a huge new group of value-seeking insurance shoppers working with a responsive private sector. Instead of expanding dependence on the already-unsustainable government health plans of Medicare and Medicaid and then reducing payments and restricting medical care, vouchers can partly or even totally replace those systems. Innovation comes from the private sector, not government, and there is no reason the health insurance industry would be an exception. This single policy change would reduce health care expenditures on the order of hundreds of billions of dollars, while eliminating the crippling burden of health costs on American businesses created by historical accident rather than thoughtful intention. Sixth, Congress can ﬁnally muster the courage to push back against the trial lawyers and ﬁx the medical-liability system. Even acknowledging the important goals of ensuring quality and protecting patients’ rights, the medical-liability legal system imposes a tremendous ﬁnancial burden on the U.S. health care system, estimated at over $80 billion per year. Doctors and hospitals not only pass on the direct costs of increased malpractice premiums but also provide a greater number of expensive and relatively unproductive medical treatments out of fear of litigation. The additional cost of defensive medicine is estimated to amount to tens of billions of dollars per year, up to 6 percent of total costs. Research by academics and government agencies suggests that commonsense reforms to the medical-liability system—reasonable caps on noneconomic damages, giving patients and providers more freedom to experiment with alternatives to traditional courts for resolving disputes—can compensate victims more quickly, reduce costs, and enhance incentives for doctors and hospitals to take more appropriate precautions against medical errors. We need to consider a signiﬁcant rethinking of the entire legal relationship between patient and care provider. While our senators and representatives, under the direction of the Obama administration, debated their ideas to remake America’s health care system at a massive cost to our children and future generations, they continued to deny the existence of clear alternative reforms that would lower health care costs, increase choice of insurance, and maintain the excellence of our medical system. Cloaked with the argument that “doing nothing is simply unacceptable,” our government embarked on a sweeping takeover of American health care. The result included government mandates and penalties on individuals and businesses, a dramatic expansion of already-unsustainable government insurance programs, and new government authority to regulate access to medical care, physician-patient decision-making autonomy, and insurance benefits. Innovation comes from the private sector, not government. There is no reason the health insurance industry would be an exception. It may shock many Americans that the same health care systems held up as models for an American overhaul are held in poor regard by the very people who live under them. Meanwhile, evidence shows that countries with heavy-handed, government-run health care systems have failed to control escalating costs. 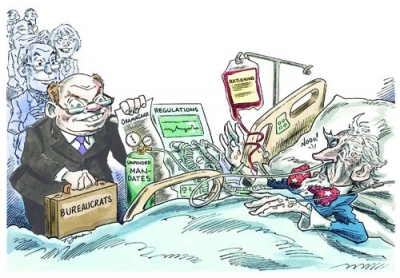 Even welfare-burdened nations like Sweden are introducing privatization as part of their solution to the economic challenges of health care. Consider that 80 percent of Americans say that access to the most advanced tests, drugs, and medical procedures and equipment is “very important” or “absolutely essential,” yet our government’s economic advisers stress limiting their use. Worse, we risk a degradation of physician quality, owing to the impending price (and therefore wage) controls for health care providers and hospitals. Does anyone believe that the best and brightest will continue to pursue a profession requiring years of rigorous training and sacriﬁce when, in the end, government ﬁxes wages and bureaucrats dictate decisions? And does anyone think that the federal government will refrain from trying to force doctors to accept lower prices by tying additional licensure requirements to acceptance of those prices? Countries with heavy-handed, government-run health care systems have failed to control escalating costs. Much of the urgency for reform was pressed on the American people by distorting problems with the system and ignoring facts that point to the excellence, indeed superiority, of American medical care. While the economic failures of the growing burden of health care spending are enormous and fearful to contemplate, the more dangerous consequences of the impending radical transformation of America’s health care system also menace our families. The leadership position of American health care, with all its flaws, is at serious risk. All who value control of their own health decisions, access to highly trained subspecialty doctors of their own choosing, continued advances in new diagnostic methods, and safer, more effective treatments must recognize what they are about to lose. We need creative, bold leadership to stop the slide to nationalization of health care that has been proven worldwide to reduce choice, restrict access, and harm patient outcomes. If allowed to stand, this shift of power from patients and their doctors to government bureaucrats would mark the end of health care as we know it. Adapted from Reforming America’s Health Care System: The Flawed Vision of ObamaCare, edited by Scott W. Atlas (Hoover Institution Press, 2010). © 2010 The Board of Trustees of the Leland Stanford Junior University. Americans have better survival rates than Europeans for common and rare cancers among both men and women. Breast cancer mortality is 52 percent higher in Germany than in the United States and 88 percent higher in Britain. Prostate cancer mortality is 604 percent higher in Britain and 457 percent higher in Norway. The mortality rate for colorectal cancer among British men and women is about 40 percent higher. Americans have lower cancer mortality rates than Canadians, whose system is a model of government-controlled health care. Breast cancer mortality in Canada is 9 percent higher than in the United States, prostate cancer is 184 percent higher, and colon cancer among men about 10 percent higher. Americans have better access to treatment for chronic diseases and earlier access to new, life-saving drugs than patients in other developed countries. Americans have better access than Canadians to all commonly used preventive cancer screening methods: mammograms, Pap smears, prostate-specific antigen (PSA) testing, and colonoscopies. Lower-income and elderly Americans are in better health than comparable Canadians. Americans spend less time waiting for care than patients in Canada and Britain. Those patients wait about twice as long—sometimes more than a year—to see a specialist, have life-changing elective surgery such as a hip replacement, or get radiation treatment for cancer. The overwhelming majority of Americans, about 80 percent, are satisfied with their own health care. More Americans are satisfied with their care than Canadians. Americans have better access to important new technologies, including safer, non-invasive medical devices and diagnostic tools such as CT scanners and MRI machines, than do patients in Canada or Britain. American doctors and medical scientists lead the world and are responsible for the vast majority of the most important health care innovations.